The American national team has a rich baseball history. 2013 Panini USA Baseball Champions combines the past and the present, delivering the first full pack-based release for the program. Every hobby box delivers three autographs and a pair of memorabilia cards. 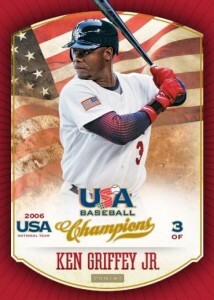 2013 Panini USA Baseball Champions has a 187-card bases set that includes current national team members and alumni from the past four decades. Vintage photography captures several Hall of Famers from their youth. Blast from the Past Signatures is an all-alumni autograph set. Signers include Frank Thomas, Barry Larkin and Jim Abbott. 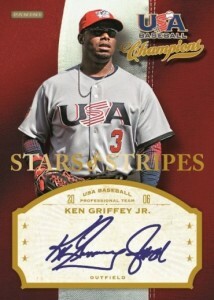 Stars and Stripes Autographs have some of the greatest players to ever play for Team USA, including Ken Griffey Jr. Current USA Baseball players have several levels of autographs using foil-based Certified designs and Mirror parallels. 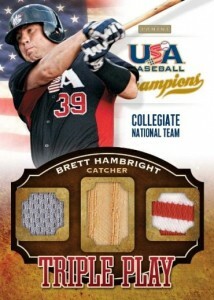 2013 Panini USA Baseball Champions has more than 1,500 Prime Patches, giving collectors low-numbered, unique memorabilia pieces. These include flags and sleeve patches from the likes of Gerrit Cole, Michael Choice and Matthew Purke. 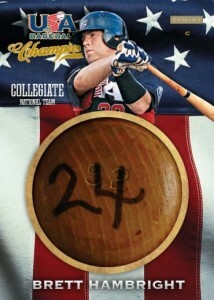 The release is also the first to have USA Baseball bat knobs. Triple Play Materials cards come with three different memorabilia pieces: a jersey swatch, a patch piece and a bat swatch. Good: Pack-opening experience brought to USA Baseball for first time, strong prospect collecting appeal, strong alumni autograph checklist, great inserts. The Bottom Line: Panini's use of the USA Baseball license has delivered strong efforts since it was first announced in 2012. For the first time, USA Baseball fans have the opportunity to purchase a pack product available at both hobby and retail. In the past, collectors have had to rely on finding USA Baseball cards in other products or purchasing a factory set. By delivering a product that relies on the traditional excitement of pack opening, 2013 Panini USA Baseball Champions provides a diversified mix of content for many types of collectors. The cards rely on a photograph of the featured player in the foreground with an American flag in the background. While I appreciate the patriotic attempt, the flag that was utilized appears as if it has been dragged through the streets. It would be customary to appropriately dispose of a flag in such condition. To use it as a backdrop on a product celebrating our national team just rubbed me the wrong way. 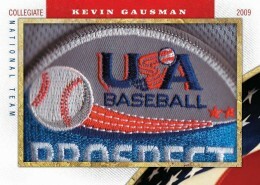 The card fronts are a little busy with the USA Baseball logo, brand name, and other text taking up a lot of space. The cards have a border but it would have been better off without. Using a full bleed on the top edge and the left and right margins would have provided a better looking card. By incorporating other popular design elements from the Panini arsenal, like Certified, and Diamond Kings, the box break itself provides for a diverse experience. Both the current national team and alumni are well represented on the checklist. In particular, the alumni in the autographed and non-autographed inserts provide a veritable who's who of former USA Baseball greats including Ken Griffey Jr., Nomar Garciaparra, Chipper Jones, and Frank Thomas. Released at a price point of $80 per box, the product was already scheduled to deliver built in value based on a pack-out configuration that include a pair of autographs, three memorabilia cards and a bunch of inserts and parallels. Collectors can currently find unopened hobby boxes for around $60, which makes this product an exceptional value. The aforementioned use of Certified ans all of its Mirrored parallel versions including die-cuts, as well as the inclusion of a strong alumni component to the product, makes for a fun rip even if you aren't familiar with every player you pull. Part of the fun is actually learning about these young players and targeting specific ones to watch as their careers develop. the triple play cards are cool. Doesn’t get much better than USA Baseball. Nice past or present element adds even more value. Any idea how much a box? Every year the USA set gets done, Upper Deck, Topps, and now Panini. This year looks great, the past decade most of the USA cards have been pretty bland. I paid $69 for a box I was talked into. Terrible product. Yeah, there are big names, but Panini isn’t stupid. Everything worthwhile is short-printed. The base set is absolutely worthless. My autos were Mark Mulder /499 (He is a wash-up who never lived up to his potential), some joker Betts, catcher numbered to /49 and another joker Jesse Winker. Game-used were guys you have to wait 10 years to get a return. As sad as it is, ebay is the deciding factor. Not one of these autos sold for more than $6. Reality is we buy to resell to buy again. I won’t even make $10 off the box. These products have to go away. There is a reason they are discounted. After 40 years in the hobby, I think it is time to get a new one. Anyone who gave this product high marks pulled something they could make their money back on. To be honest, few collect for PC anymore. I will never buy Olympic stuff again. My second Olympic box in two days, and both were horrendous. Enjoyed opening and overall “Look” of this product. As far a value, I think it is well worth the money. I got my box on ebay for $58 with free shipping and based on other products I have opened, this was a steal. Good prospects. My box main hit was a Gallo auto and a Bryant jersey. absolutely nothing for the !00+ dollars you spend for that priviledge. No, baseball cards are not always meant to be bought, sold, and bought again. Craig is absolutely wrong on that point. And baseball cards are certainly not a product to put money into in order to see a return, unless you have a business license buying and selling unopened packages either online, or in your own brick and mortar store at retail prices, after purchasing at manufacturer’s price. And if you are one of the few who purchase specifically to flip cards forr a profit, buyer beware. It works like stock brokers on Wall St. do. They purchase stock at low prices, and sell at high prices. They do so, fully aware that it is a risk they are taking on. Just like those who run their own businesses, and yes, including hobby shop owners themselves. They take on that burden of risk, in the hopes of making profits. It doesn’t always work out that way. Having said that, this is a hobby. The vast majority of the hobbyists do not purchase cards to flip them for a profit. That is completely incorrect. The vast majority of them purchase them, because they enjoy expanding their collection. That’s why there is a market. Not everyone are sellers. If that were the case, there would be no market. Therefore, a 1 star rating is completely unjustified. Giving 5 stars to counterbalance that.